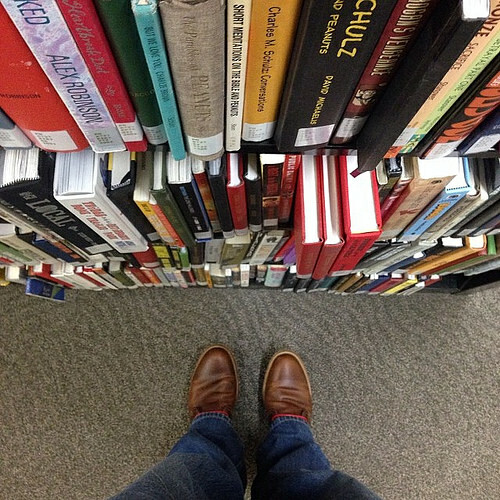 #libraryshelfie day on Instagram is Wednesday January 29. What’s a library shelfie? It’s just like a selfie, but taken with books. You can shoot your photo in Gleeson, at your favorite bookstore, in front of your own library — wherever you and books happen to be! If you’re into being in the photo great – but certainly not necessary. Just Tag your Instagram pics with @gleesonlibrary #libraryshelfie and please tag our pals at New York Public Library #NYPL library who came up with the idea. UPDATE: There’s a small wager between Gleeson Library and SJSU King Library. The Library with the most #librarySelfies tagged (#GleesonLIbrary #USFCA for us or #SpartanShelfie #KingLibrary for the folks at SJSU) wins bragging rights and a sweet treat. Gleeson has put up a delicious box of San Franciscso’s finest Ghiradelli chocolates and SJSU has put up a box of Schurra’s chocolates. I can’t wait to see the final results with USF on top!! I look forward to sharing those delicious Schurra’s chocolates with you Dons! Eric Ewen, Head of Cataloging, wrote the following piece on the recent retirement of Kathy Woo, Head of Acquisitions. Kathy Woo, center, at the library table of a campus involvement fair. Our beloved colleague Kathleen Ann Magri Woo joined the Gleeson Library as an assistant cataloger at precisely 9:00 A.M. on Tuesday, September 3, 1974. On the ecclesiastical calendar it was the Feast of St. Gregory the Great, which portended the great things Kathy was to achieve during her long and illustrious career here. Also, on that auspicious day, two other junior librarians became members of the Gleeson staff, namely, Eric Ewen (assistant cataloger) and the late Steven Corey (special collections librarian). Never before or since has Gleeson hired three librarians on the same day. It was a glorious moment for the late Dean Robert L. Gitler. In those days technical services—cataloging and acquisitions—had no offices or cubicles. It was a sea of desks. [The poor reference librarians had it worse; they had to share desks!] Everyone had a typewriter. There were no computers. The only automation consisted of a photocopy machine. Yet everyone was happy and productive. The starting salary was $8,848 per annum. We all thought that was a lot of money. Believe it or not, technical service librarians, but not reference librarians, were allowed to smoke at their desks. Catalogers, of course, knew better; only some of the acquisitions staff took advantage of this dubious privilege. In 1974 the Catalog Department consisted of 4.5 FTE librarians and 4.0 FTE technical staff. Nearly all incoming library materials were in print format. Among her general duties, Kathy cataloged all non-book items, which were mainly music and spoken sound recordings. After three years as a cataloger, Kathy transferred to the Reference Department in 1977. She said her experience in cataloging helped her become a better reference librarian. With due respect to the senior reference staff at the time, patrons found Kathy to be neither intimidating nor unapproachable. Patrons, like her colleagues today, found her to be warm, friendly, personable, and helpful. Kathy applied for and was selected as the Head Periodicals Librarian when that position became available in 1980. Here she oversaw a print journal collection of more than 2,400 titles. This work was to occupy her for the next twenty years. In the meantime Kathy was busy outside of the library. She married her husband Gordon, obtained a second master’s degree in modern European history from San Francisco State University, gave birth to and raised a “king’s family” (that is a girl, Lauren, and a boy, David). Time passed. In 2000 when Mrs. Hille Novak retired as Head Acquisitions Librarian, Kathy applied for that position and was selected. This was her fourth position at Gleeson, all in different departments, two of which she headed. It is a characteristic of Kathy that she was always looking for new challenges, new opportunities and new responsibilities. This is perhaps what makes her not only the most complete librarian at Gleeson, but also the perfect librarian. [“To improve is to change. To be perfect is to change often.”—Churchill]. Even though she is leaving the library, Kathy’s future looks very bright as Librarian Emerita. She will have postcards to write (from London, Paris, New York, and Maui), lots of sustained narrative reading to do, silent film festivals to attend, and grandchildren to spoil. May she find as much happiness and success in retirement as she did when she moved easily and gracefully about the Gleeson Library. 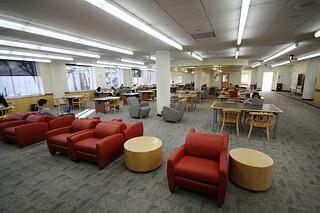 Over the last few weeks we’ve done a little rearranging on the 2nd floor of Gleeson | Geschke. We love the way the study space looks and we hope you do too! While we had the floor cleared of furniture, library folks kicked around a few ideas on how we could have a little fun. Skate ramp? No go. Bowling? Nope. Nerf wars? Promising, but not this time. After much discussion, this is what we came up with. 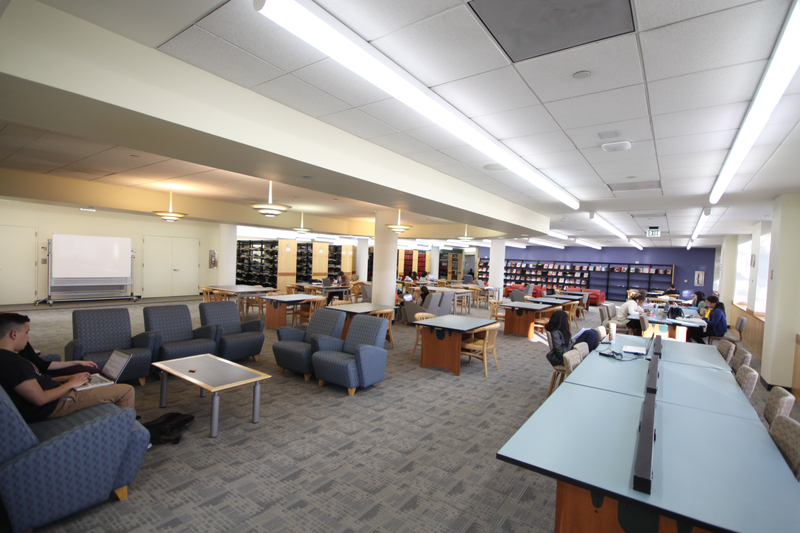 Fifteen library staff and student helpers lined up 1,411 books over the span of 6 hours to bring in the new study space on the second floor of Gleeson Library | Geschke Center. The last book, caught by Janet Carmona (library staff) was “Spectacle” by USFCA prof Susan Steinberg. Full disclosure – lots of inspiration for this project came from the Seattle Public Library. SPL holds the world record for book dominos. Also, many thanks to USF’s Office of Communications and Marketing for making the video. What a difference a little carpet, paint and some furniture can make! Please stop by the second floor of Gleeson | Geschke to check things out. We hope you’ll like what we’ve done and you might agree – it’s one of the best spots in the library to study! Thanks to Shae for the blog post idea! 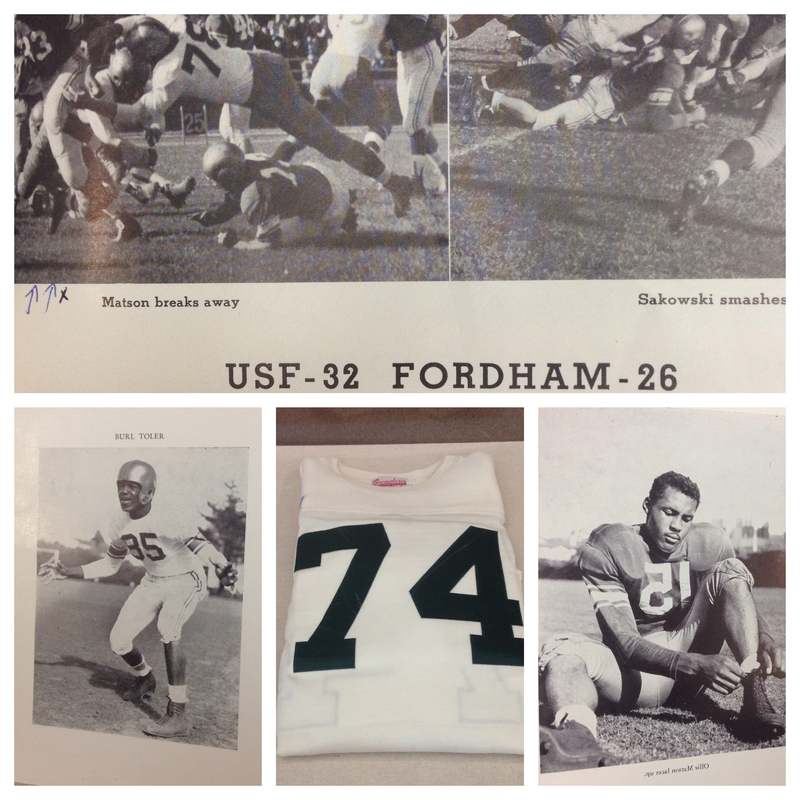 The ’51 Dons football team is being honored all week at the University of San Francisco. We’ve put together a few things from #usfca’s Archives and made a display in the library. My favorite – a replica jersey from the 1951 season. Players in the photo include Ollie Matson, Vince Sakowski and Bert Toler. Look for the ESPN special coming up soon and follow Dons Athletics for all the news about this weeks events honoring the ”Unbeaten, untied and uninvited“ 51 team.